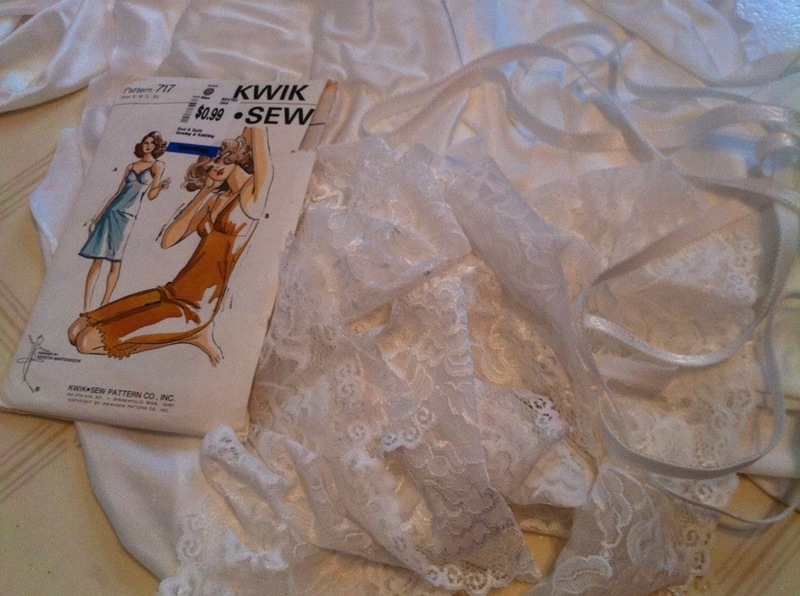 So if Butterick 6031 is not your grandma’s slip, Kwik Sew 717 totally is. Or at least, your mom’s. Ok, my mom’s. “Designed for knit and stretch fabric, nylon tricot” as the pattern proclaims. 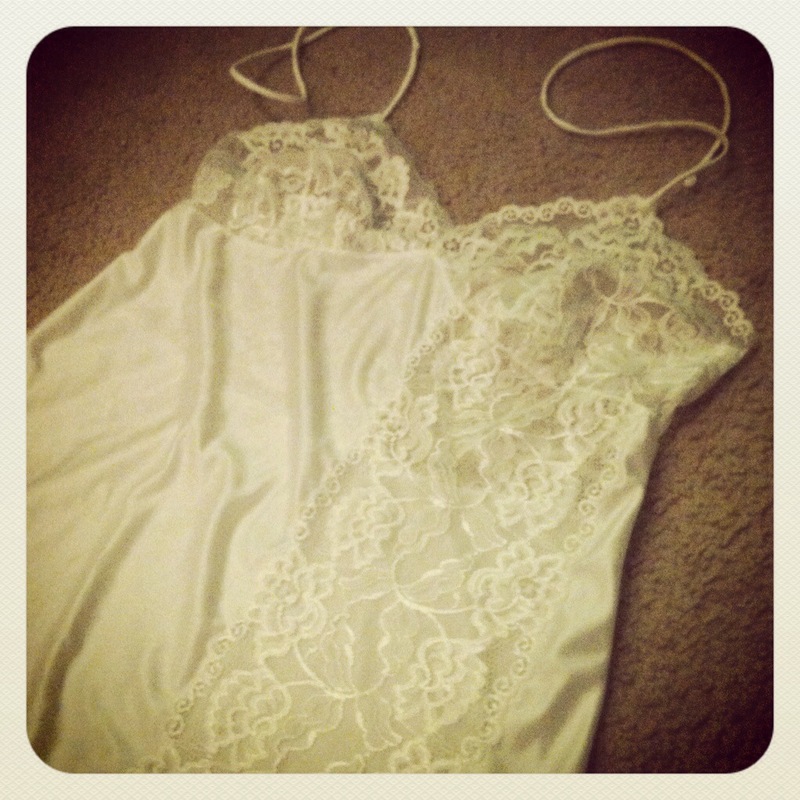 I eventually settled on this one out of the several stash contenders for my ivory “vintage” slip. However, I was also determined to use the 2m of lovely wide stretch lace I got at the same time, rather than just making the pattern up as-is. I think I like the result, but it definitely added another layer of complexity to a project that already had plenty of unknowns. First I decided I wanted to use my lace for the cups. This required some piecing, since the cups are one-piece and I wanted the scalloped edge of the lace to follow both the upper edges of the cups. I wouldn’t say I’ve done a lot of lace piecing, but I did a wee bit on Gertie’s slip (and more last summer, by hand), so I felt comfy stretching myself just a little bit more. Lace piecing, with a narrow zig-zag stitch. 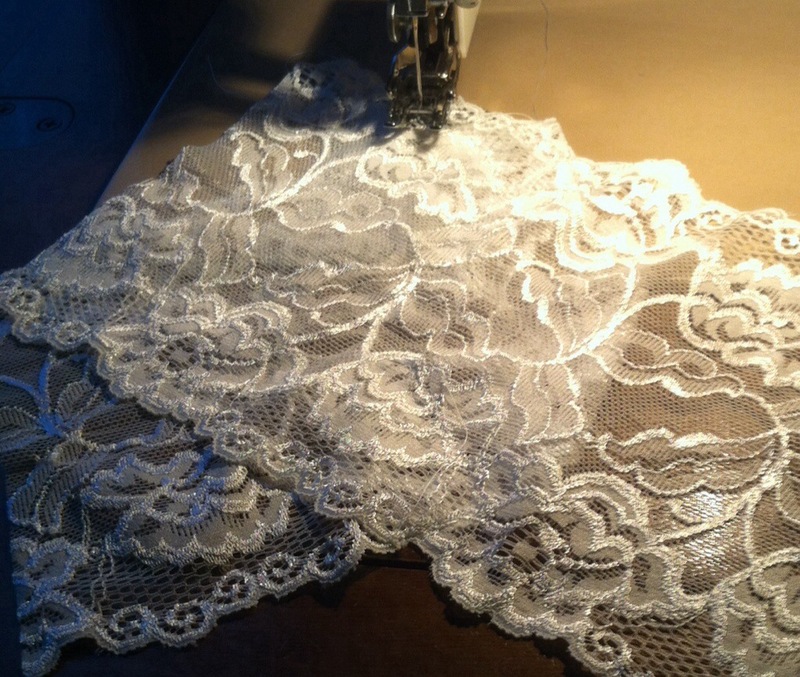 I cut chunks of lace long enough to overlap at the right angle and cover as much of the pattern-piece as possible. I pinned them in place at the correct angle so the scalloped edge would follow the top edges of the cup pattern piece. I put some tissue paper underneath for added stability, and then zig-zag stitched across the pieces, starting at the top point, to join them. I quite like it, lining up the pieces and zig-zagging along the edge of this motif or that—it’s kind of like a maze, finding your way across the fabric to where you’d like to end up. Excpept for the part where, on my first cup, I did an awesome job of following the outline of a rose which, it turned out, was on the side of the zig-zag that needed to be trimmed off, leaving some distinctly nonsensical and not-terribly-invisible zig-zags. I contemplated re-doing it, but at this stage in construction I wasn’t sure if I was even going to end up with a wearable garment, never mind a pretty one, and also THIS THING IS TOTALLY SEE-THROUGH NO ONE BUT ME AND OSIRIS IS EVER GOING TO SEE IT. Well, and now half the internet, but y’know. See my awesome nonsense zigzag? I made skinny self-straps, as suggested by the pattern. Oh, and they instructed you to use the bobby-pin method for turning! ACE! With a bit of alteration, I figured I could make the upper back piece out of lace as well. The slip has an odd back with a curved seam partway down—interesting, and it gave me the opportunity to do some swayback altering, so that was nice, but it’s a bit random, especially since it’s not like the upper back piece is terribly fitted. But it looked nice out of lace. The fit of the cups was interesting. There are two small darts on either side of a gathered portion along the top. And the sizing is about right for me in a bra (it takes a bit of padding to bring me up to standard pattern bust size), but the shape fits actually much better “au natural.” I do think the sizing would be better in the fashion fabric—the lace is pretty stretchy. A little too stretchy, really, but again. Experimentation and learning. Anyway, once I had the cups pieced and the back cut, I still had quite a bit of lace left over, so I thought it would be a great idea to add a wide lace panel down the front. Gorgeous, right? Well, yes. Aside from the bit where the lace stretched more than the nylon and despite all my careful pinning there’s a bit of puckering that just won’t go away. And the width of the panel seems to alter the drape of the skirt, which isn’t entirely awesome. I’m hoping that the gorgeousness of the lace itself will carry it. 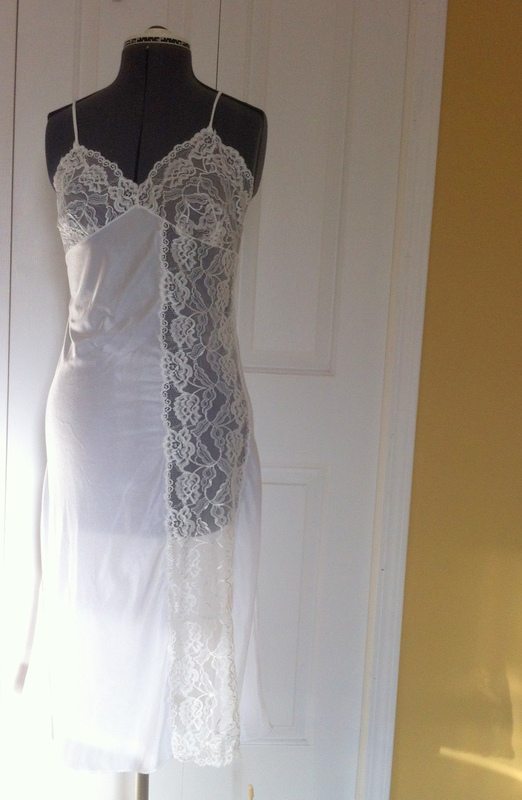 Slip front, imperfect drape, also not positioned on the dress-form terribly well. 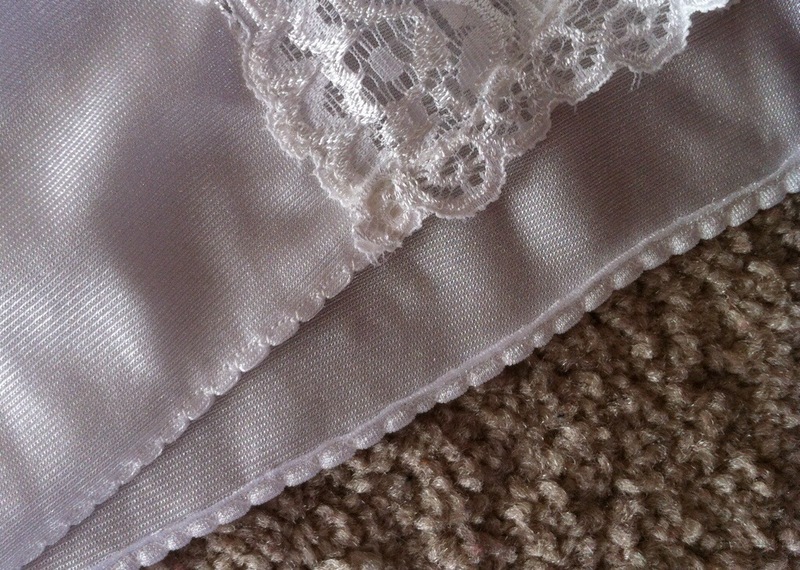 Pieced lace scallop along the hem. I did a little more lace-piecing along the bottom of the lace strip, to get a nice bottom edge. Stretch lace is not the easiest for this kind of piecing, I think—I could’ve had a bit more tension on my pieced in bit. But, it looks pretty nice, and I don’t know how else I could’ve finished the edge. 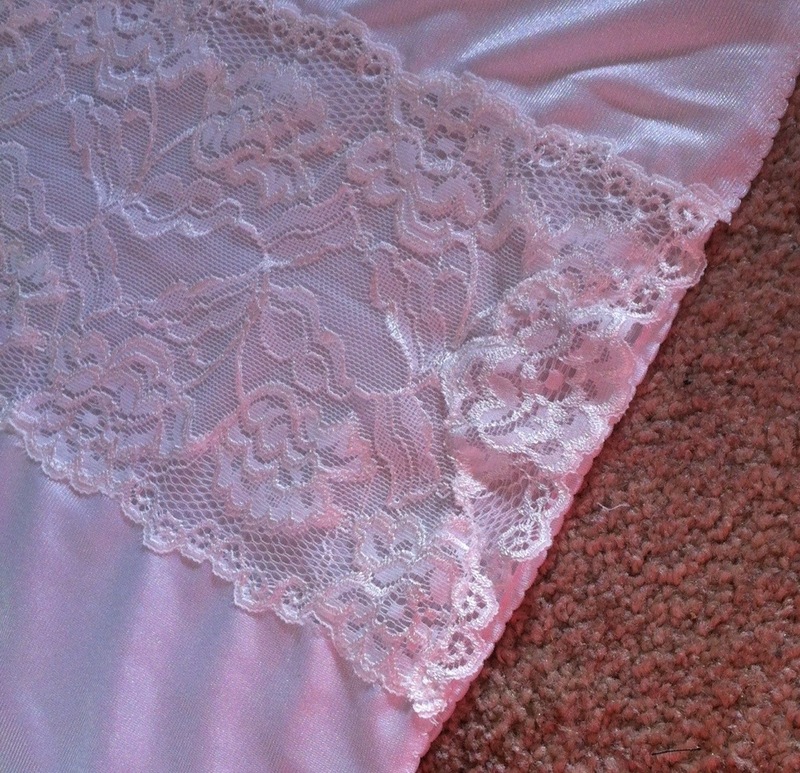 I played with a couple of hemming ideas—I had originally gotten a “matching,” somewhat narrower lace for the hem, but once I got it home it became obvious that it was much less shiny and much more white than my main lace. Not right. The pattern suggests a lettuce-edge (which is just a tight overcasting zig-zag while stretching the fabric), but I couldn’t get it to work without my fabric scooting to the side, so that wasn’t in the cards. So I settled for a shell hem, once I had looked up the settings on the Rocketeer and played with the stitch length. This fabric is absolutely made for a hem like this, I have to say. I’ve never had such a nice, even result. It’s a bit low-key compared to the crazy lace, but I think it works. OH AND NO ONE WILL SEE IT. Random detail closeup. You can see my topstitched seamline. So really, this slip was a learning experience, more than anything else. Practice with techniques and fabrics I haven’t used much. Fun, and weirdly low-key BECAUSE NO ONE WILL SEE IT. I actually want to do it all over again, right away, without the lace, just to see how that compares. 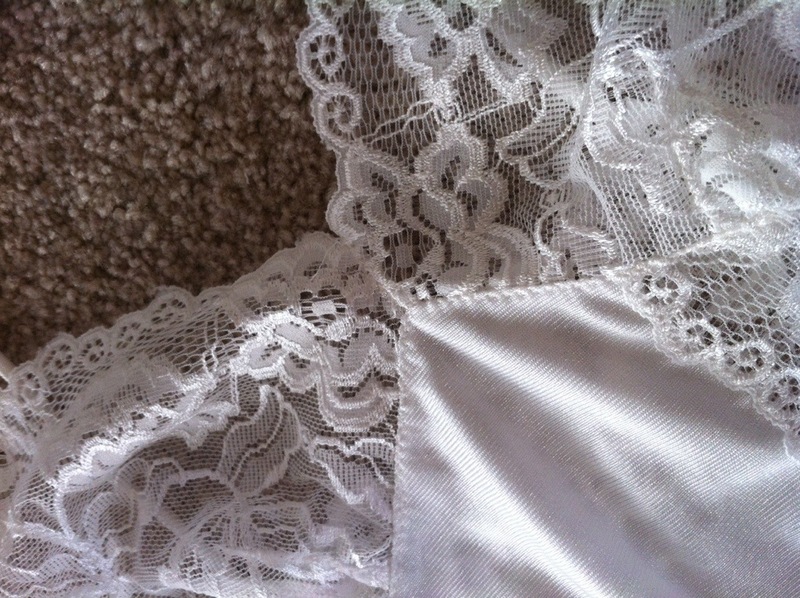 And because I’m not entirely convinced the lace will work really well for under the white dresses. Being see-through ‘n all. And without all the fussing with lace-piecing, I think this would be a really quick, easy make. So pretty, even if no one will see it! Dude(tte)- we all “saw it” and you rocked it! Love slips myself, and they are so hard to find now. I must try this. Great job! Beautiful slip 🙂 the slip I made earlier this year didn’t fit. Need to get more supplies and try again. Aww! That happened with my attempt at the Ruby Slip a few years back… Still wadded as a UFO somewhere. 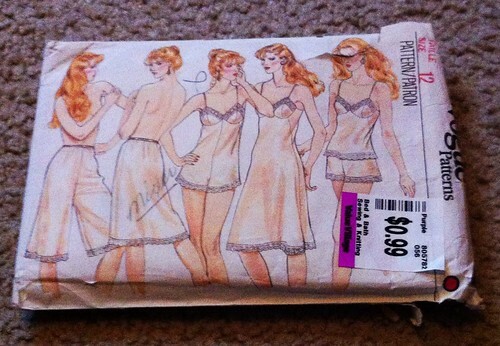 Though, I think my fabric choice was not very slip-appropriate, either. I’m always amazed by how much use I get from garments with less-than-perfect technique. The minute I stop working on a garment, preferably after a week on a hanger or following being washed, I care very little. As long as it all stays in one piece 🙂 This may be a learning piece but it is lovely, and you will likely get a lot of use from it. In every case, different amounts of stretch can cause all sorts of problems. And I quite like lace in slips but I tend to worry about using it in the skirt part: It seems like it would stick to one’s tights. What’s your experience with that so far? Of course Gertie herself wrote a blog post about that ‘not your Grandma’s…’ (http://www.blogforbettersewing.com/2012/05/generational-aspects-of-crafting.html) so I’m sure she would approve the somewhat vintage pattern. I really like the piecing you’ve done on the cups, they turned out super neat. I made up a bias slip using a cotton fabric, which I thought was a great idea because of the breathability but of course, it clings to fabric worse than my skin would. I really have to figure out if I can use the same pattern but do a stretch fabric rather than bias woven. Looks awesome! I’ve been wanting to make a slip too. This is a great series of slips! I enjoy getting into a groove making similar items one after another; the skills I learn seem to stick with me longer and the product improves measurably. I have to keep checking where you are to make sure that you can’t possibly be scoring the slip patterns at MY Value Village (Seattle, WA), the patterns I never ever see. Thanks! Yeah, there’s something about making multiples, isn’t there? Practice makes perfect, etc. Your slip turned out lovely…. never mind about “nobody will see it”, the most important people will see it… that’s you and your someone. May have to get my pattern out and give one a try. Hard to find a slip at the store any more. Sounds like you had to do quite a bit of thinking with this project, as well as try new techniques and play with different fabrics…all up sounds like a lot of fun, and you have a beautiful slip at the end of it. Have seen it, and am in awe! Beautiful!